Our farm was established in 1996. 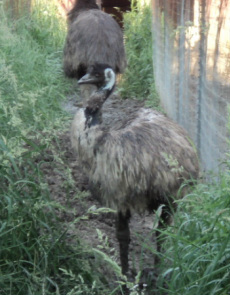 Our emu's are fed an all natural feed, free of hormones and chemicals. This allows us to produce the highest quality meat and oil products. It's almost spring on the farm and we are waiting for the emu's to start laying. We have some new breeding stock this year and we are excited to see what they have to offer. That also means sheering season is just around the corner. The alpaca's are warm and wooly right now, so their fiber should be fabulous. This will also be the first sheering for the new Cormo lambs. Come visit us this summer to see all the new things on the farm. We will be at the Lindstrom Farmers Market in Lindstrom MN. The market is located at the St. Bridgets Catholic Church parking lot and will opening for the season on Wed July 8th. Market hours are Wed. 3-6:00 and Sat 8-12:00. The market runs through the pumpkin season.